It was otherwise an ordinary day for me inside the foreign office. 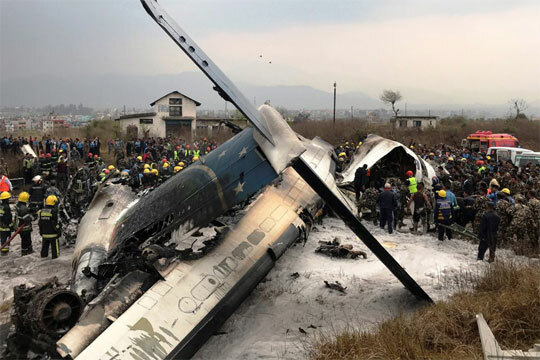 Yes, only until around 2.40 p.m.
when my cellphone rang with a call from our Ambassador in Nepal with the devastating news that the Kathmandu bound US Bangla Plane crashed at the Tribhuvan International Airport a short while ago. Ambassador Madam was already rushing to the airport and she wanted me to urgently disseminate the details of the just opened embassy hotline through the Dhaka-based print and electronic media. Kathmandu being my immediate past work station until just a few months ago I was a frequent traveller in the Kathmandu-Dhaka-Kathmandu route. I can’t exactly recollect on how many occasions I availed the US-Bangla flight. After introducing their service around two years ago, they had been trying heart and soul to win the hearts of Kathmandu bound tourists from Bangladesh particularly the young professionals and students who are fond of traveling to the mountainous South Asian country. The predominant number of young passengers who used to fly in groups on the flight would often give me the feeling of a picnic bus and the one hour travel time would pass in almost no time. One Biman Bangladesh Airlines flight in the Dhaka-Kathmandu route during last rainy season was, however, particularly scary for me. The flight took off from Dhaka at around 10 a.m. and was supposed to land in Kathmandu airport at around 11.30 a.m. The flight was delayed and we reached Kathmandu’s airspace at around 3.00 p.m. but the flight was unable to land due to inclement weather. It was patrolling the skies of Kathmandu for an hour and a half and at one point the announcement came that due to bad weather and shortage of fuel it will detour to Dhaka for landing. I don’t know what would have happened that evening if landing was not possible also in Dhaka! Anyways, at the mercy of Almighty, we had a smooth landing in Dhaka and after refueling the plane again took off at around 10 p.m. I recollect on that occasion I reached home at midnight. Back to the US-Bangla, this is the first time that any airline from Bangladesh has met an accident in an international route. Incidentally it was also my first ever experience to receive calls from all corners in the aftermath of the accident as one of the focal points of the Foreign Ministry is the hotline. Anxious relatives of the ill-fated passengers were calling from all directions to know the statuses of their near and dear ones and in almost all cases I was just short of an answer. How many news of deaths you can convey in a span of half an hour/one hour? How helpless you feel when you hear the heart wrenching voice of an inconsolable mother at the other end? What is the right language to convey the most devastating news of death to a family member? Out of 71 passengers on the Flight, 36 were from Bangladesh. The calls I received were not just around 36, rather those were multiple times that number spanning the whole night and the most part of the following day. My helplessness was that I couldn’t be the source of positive news from my end, for which they took the pain to call me up. However, I also felt each caller’s helplessness “if I could contribute to changing course somehow ex post facto so that the fatal error could be corrected (!) and all the lives could be saved”. Last few weeks avionic experts at home and abroad have elaborately discussed the plane crash; however none is decisive. The government of Nepal has formed inquiry teams to examine data and facts and probably know exactly what went wrong. Every day I receive phone calls from distant places if the reasons are known already, if not what might be the probable reasons. Sometimes I got into lengthy conversations with relatively informed callers. The tragic example of Malaysian Airlines 777-200 that flew in the Kuala Lumpur-Beijing route on 8 March 2014, disappeared with all 227 passengers and 12 crew members. Its current location and status is still a mystery. Within four months, another aircraft of the same airlines on a scheduled international flight between Amsterdam and Kuala Lumpur was hit at about 33000 feet by a surface to air missile killing all 283 passengers and 15 crew members. What a series of misfortunes for one particular airline in international aviation! Surely, our short lives in this beautiful planet are further cut short by man-made or natural tragedies worldwide. The victims of US-Bangla flight through their precious lives have once again shown that all the love of the world is stored only in one human being for another and there is no room for conflict and hatred, anywhere. We have only love for others! Souls of all passengers who lost their beautiful lives in tragic plane crashes RIP!